Monsanto launched a PR offensive to try to spread doubt about a study published two days ago by French scientist Gilles-Éric Séralini: the study showed that the biotech giant's flagship herbicide, Roundup, and one the GM maizes produced by the firm, NK603, are having disastrous effects on rats' health when those are studied during their lifetime and not over the industry-favoured 90 days. In an email seen by CEO (see below1), a Monsanto executive sent around the list of reactions compiled by a so-called “independent” science news resource, the London-based “Science Media Centre”. Under the objective-sounding title “Expert reaction to GM maize causing tumours in rats”, the Centre lists eight reactions by scientists about the study as well as 10 unattributed arguments on the same issue. Unsurprisingly, all the reactions dismiss the study. According to Spinwatch, 70% of the Centre's funding comes from corporations, and their list of funders includes most of the big names in the biotech industry. This misinformation seems to have worked: the three critical quotes mentioned by the newswire Reuters about the study (Tom Sanders, Mark Tester, David Spiegelhalter) were all circulated by the Centre. The biotechnology lobby group Europabio also issued a press release quoting these same experts and listing all the arguments it could find to try to discredit the research. While this is probably just the beginning of the biotech industry's attempts to undermine the credibility of the new study, EU institutions and EFSA will not be able to continue with business as usual. French scientist Gilles-Eric Séralini indeed hit the headlines yesterday with his groundbreaking paper on rats being fed with Monsanto's GM Roundup-ready maize NK603, published in the authoritative scientific journal Food and Chemical Toxicology. “The longest and most detailed study ever carried out on a herbicide and a GMO”, in Séralini's own words yesterday at a press conference in the European Parliament, looked at the impact on rats' health of both the GMO and Roundup, the herbicide it is made to resist. Roundup is the world's most sold herbicide. The results of the study are stunning. Not only did the rats tested with Roundup die earlier than their control group, developing severe tumours and kidney and liver pathologies, but the rats only fed with the GM maize also developed tumours. This new development in the decade-long controversy over the safety of GMOs highlights the importance of reliable expertise for public decision-making, and the key role played by regulatory agencies. It is striking that Séralini's study's initial funding came from CERES, an association funded by major French supermarkets; being wary of both official studies and the possibility of a new major mad cow-type public health scandal, they decided to provide enough resources to produce a reliable risk assessment. CEO's publications on the European Food Safety Authority (EFSA) over the past year have shown how the biotech and pesticide industry had been able to influence the so-called “independent voice of science” at the EU level. Many experts on key panels had conflicts of interest, which resulted in flawed guidelines for risk assessment. One example? The very GM maize used in Professor Séralini's paper was given the green light by EFSA for feed and food use in Europe in 2004, and for cultivation in the EU in 2009. EFSA based its assessment on a narrow range of studies that tested rats for a short period of only 90 days. Séralini points out that in his new research most of the tumors among the rats he studied only appeared after the first year. CEO has shown that more than half of the GMO panel experts who signed the approval for this GM maize had links with industry resulting in conflicts of interest, as defined by the OECD. Séralini in his press conference yesterday attacked the “competence and even the honesty” of the EFSA experts at stake. In particular the GMO panel chair, Harry Kuiper, clearly used his position to influence the work of the panel in a pro-industry way. The role played by Kuiper for 10 years is now under scrutiny of the European Ombudsman, following a complaint by the organisation Testbiotech. EFSA's policy on conflicts of interests has slightly improved since new panels were installed last July, but far from enough: CEO, Earth Open Source, Testbiotech and other NGOs have shown that several EFSA panel members still have conflict of interests with industry. EFSA's guidelines for GMO risk assessment are now about to be incorporated in new EU rules on GMOs. These guidelines actually further weaken the existing rules, not only saying that long-term trials are not needed but that 90-days trials, and even feeding trials themselves, may be scrapped entirely! The Commission's head of unit at DG Health and Consumers, Mrs. Dorothée André, tried some damage control yesterday saying that the Commission would propose mandatory 90-days trials to Member States within the framework of these guidelines' revision process, on which the European Parliament has no say. 1. 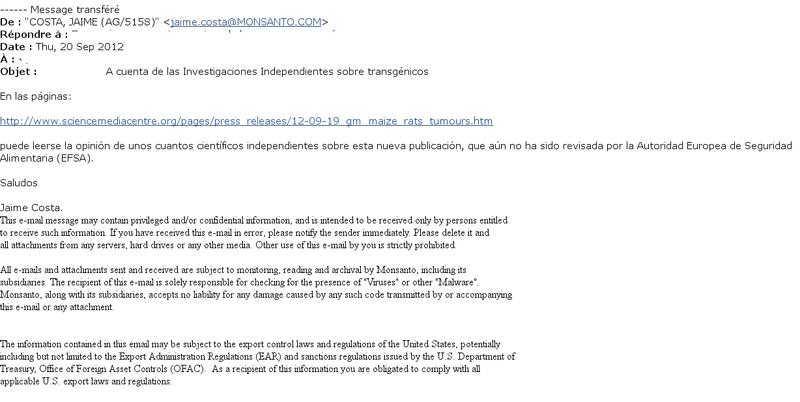 Translation from Spanish: “On this page [link] you can read the opinion of a few independent scientists on this new publication, which has not yet been reviewed by the European Food Safety Authority (EFSA).” Some details were removed in order to protect the source.